KeePassXC uses 256-bit encryption, with three different kinds of encryption algorithms, AES, ChaCha20, and Twofish. The app is a community fork of KeePass tool, which is a 15-year old tool made for the Windows operating system. Passwords are integral, and practically the basis of computer security, both offline and online. Although more advanced methods are emerging now, like fingerprint scans, or retinal scans, it’s going to take some time for these technologies to vet out and become a viable option everywhere. Until then, passwords are yet to stay. For the sake of comfort, it’s not a good idea to use the same password for multiple accounts. Also, a password must be used as a toothbrush – changed every three months. With some many passwords to across multiple accounts, it’s easy to forget, which in turn invites a lot of resetting and frustration. If you ask us, what’s the solution? We suggest you use a trustworthy and powerful password manager. Today, we shall review one such free and open-source application “KeePassXC Password Manager“. KeePassXC is a community fork of KeePass tool which is a 15-year old tool for Windows operating system. Built using Qt5 libraries, it is a cross-platform application that can run on Linux, Windows, and MacOS. KeePassXC uses 256-bit encryption, with three different kinds of encryption algorithms, AES, ChaCha20, and Twofish. All of these methods require long explanations but rest assured, these are the most advanced and secure encryption methods. KeePassXC clearly aims for a clean and uncluttered interface, so that all users, whether experienced or inexperienced, can make the best use of it. It has icons for database operations, like adding or importing them. Next, it has options for actions on entries in those databases, like adding, removing or editing them. It also has one-click buttons for copying usernames or passwords, which comes in really handy. Some other operations are explained later in the article. Overall, these easy-to-reach operation buttons make the user experience smoother and faster. 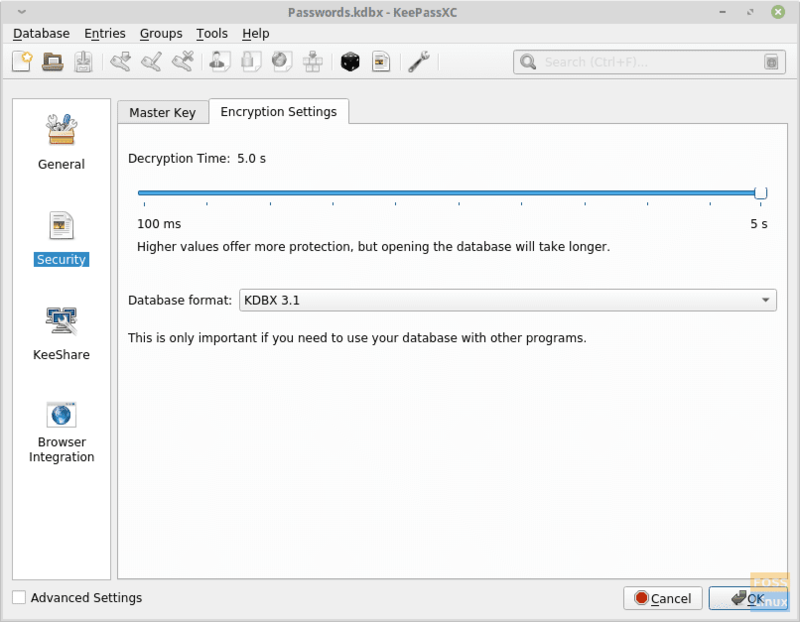 The passwords are stored in databases, with a .kdbx extension, which is specific to the program. Users can create different groups of entries inside the databases, for better categorization. A database has to be created or imported (from CSV or KeePass 1 files) on launching the program for the very first time, which will later store the passwords. KeePassXC enables importing and exporting databases in multiple formats. This is one essential feature that all password managers should have, and KeePassXC doesn’t disappoint. It has a built-in password generator, that creates strong, random passwords, with desired password length, and types of values to be used. Users can opt to use, or not use A-Z, a-z, 0-9, and special characters. There is also an option to not use characters that look similar. The password creator can also be used as a password strength checker. These features ensure the creation of brute force and cracker-proof passwords. The generator does create tough to remember passwords. This is one of the best features of KeePassXC. You can easily store the username and password, and later use it on your browser to enter the information. You can even edit the sequences. Some website requires users to press the Tab key after typing username, to type the password. Other times, websites can also require users to press the Enter key. You can edit these sequences in KeePassXC. You can always integrate KeePassXC with your browser, but even if you don’t want to, just open the website, switch over to KeePassXC, select the entry that holds the information of that website, and press the button on top that stands for ‘Perform Auto-Type‘. This will automatically enter the credentials. Life made easy, huh? The database entries are highly configurable. There is the usual title, username, password and URL entry. After that, you can add an expiration date, if there is one, and add special notes. You can also add additional data. For example, for a social networking site, if you have also stored a phone number, you can add an attribute and store that information as well. Just beside the additional attributes, you can even attach files related to the entry. There is also a choice given between 70 icons for the entry. You can edit auto-type settings for the entry so that the required username and password are entered in the correct order, and with the required key sequence. There is also an option to view the history of the usage of the entry. When creating a database, users can opt for a longer decryption time. Why? Longer decryption time means more toughened encryption. It can go from 100ms to 5s. We would highly recommend using longer times. Just some more seconds can help you protect your passwords better. 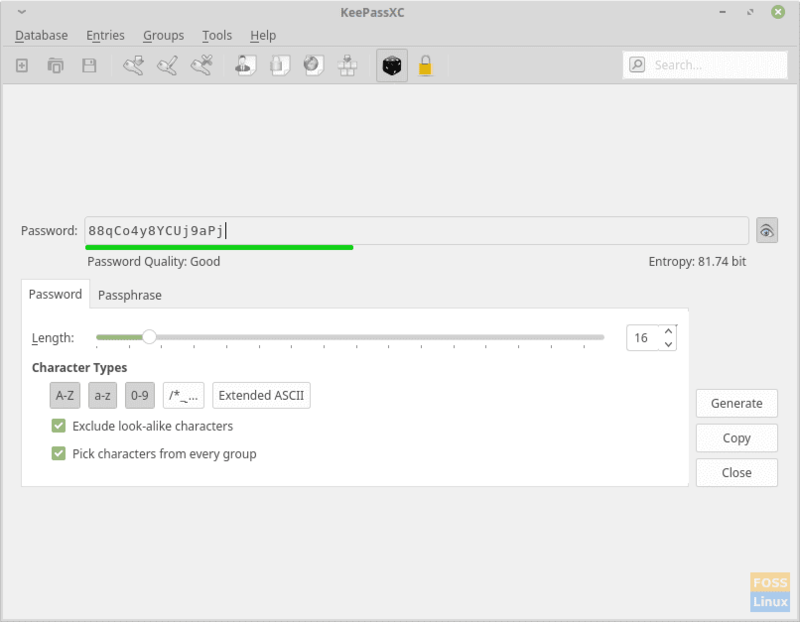 KeepPassXC has even more interesting features, like support for a key-file instead of a password to unlock a database. It even supports YubiKey, which is a USB drive that is used to ensure user legitimacy. It also has a command-line interface and SSH agent integration. f needed, SSH integration will ease using this program on a remote server as well. For a list of all major features, visit this site. Packages for KeePassXC are provided in the official repositories of all major distributions. 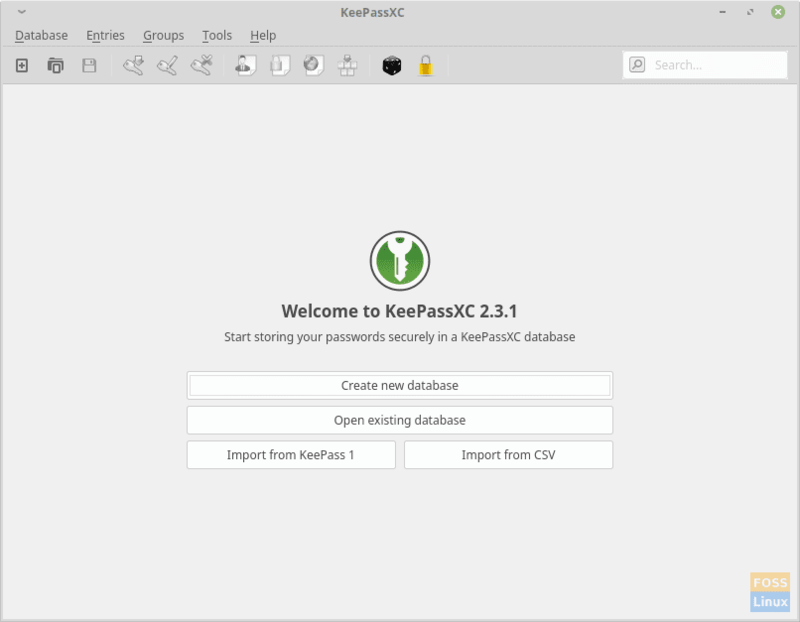 KeePassXC installation on Linux Mint. DEB packages, AppImage and installation instructions can be found here. 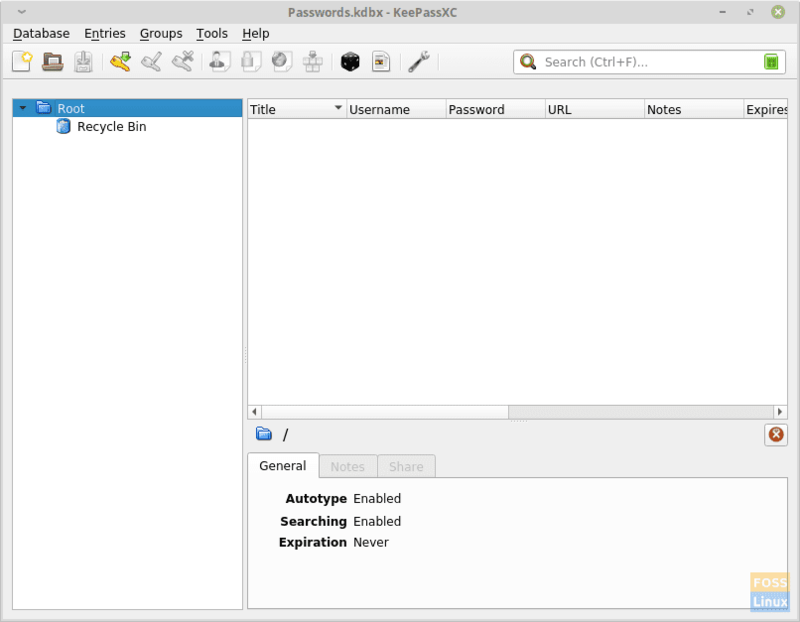 KeePassXC is a great program, having everything that you might require from a password manager, and then some more. Being a 15-year-old product, with a good track record, you can be assured that all your passwords are stored safely, and you no longer have to suffer from resetting password every time. Let us know what you think about it in the comments. If you can, surely consider contributing a donation to the developers. You can find the link here. Cheers!